The item Hal Jordan and the Green Lantern Corps, Issue 37-41, Zod's will, Robert Venditti, writer ; Rafa Sandoval, Ethan Van Sciver, Brandon Peterson, pencillers ; Jordi Tarragona, Ethan Van Sciver, Brandon Peterson, inkers ; Tomeu Morey, Jason Wright, colorists ; Dave Sharpe, letterer ; Tyler Kirkham and Tomeu Morey, collection cover artists, (electronic resource) represents a specific, individual, material embodiment of a distinct intellectual or artistic creation found in Kent District Library. 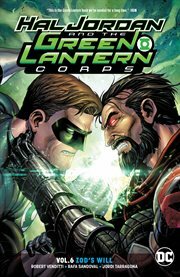 When Green Lanterns Hal Jordan and Kyle Rayner arrive on a primitive planet to investigate reports of alien interference with the local population, they're shocked to discover that Superman's Kryptonian foe General Zod and his family have taken over the planet, not as conquerors, but as gods who are being eagerly worshipped! When an exploratory mission becomes a battle royale with foes each as powerful as the Man of Steel, Kyle is badly injured and Hal is captured. Will a rogue rescue mission led by Guy Gardner, Kilowog and other rebellious Lanterns be successful? Or are they actually playing into master strategist Zod's larger plans? Meanwhile, Green Lantern John Stewart helps restore the Guardians of the Universe to a critical role in leading the Green Lantern Corps. But are his efforts too successful?